Many service oriented architecture (SOA) initiatives have stalled or failed, and with the impending 2009 budget cuts, prospects for SOA look bleak. Except in rare situations, SOA has failed to deliver its promised benefits. It’s time to face reality: the term “SOA” now carries too much baggage. 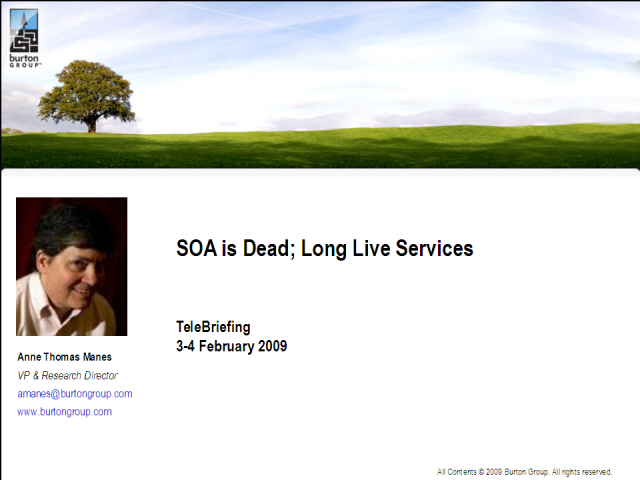 It’s time to declare SOA dead and move on to more the practical matter of bringing up its offspring: Services. Burton Group Research Director Anne Thomas Manes will examine the myths and misconceptions that derailed SOA efforts, provide guidance for salvaging value, and supply actionable direction for future efforts.